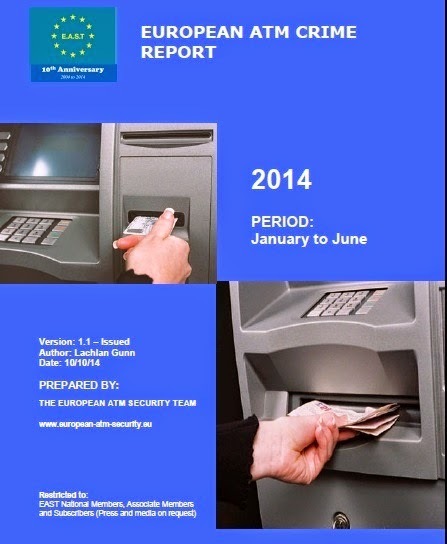 In a European ATM Crime Report covering H1 2014 (January to June) the European ATM Security Team (EAST) reported an estimated 20 incidents of ATM Malware. These were ‘cash out’ or ‘jackpotting’ attacks and all occurred on the same ATM type from a single ATM deployer in one country. While many ATM Malware attacks have been seen over the past few years in Russia, Ukraine and parts of Latin America, this is the first time that such attacks have been reported in Western Europe. The good news is that there was a 42% overall decrease in ATM related fraud attacks, when compared to the same period in 2013. For the first time card trapping incidents were in the majority with 2,579 such incidents reported, up 49% from the 1,735 incidents reported in H1 2013. Card skimming incidents fell by 21% (continuation of a downward trend that started in 2010), cash trapping attacks by 52% and incidences of transaction reversal fraud by 96%. The full Crime Report is only available to EAST Members and subscribers, but the press release can be seen on the EAST website.